90% of the nutrients we feed to animals are wasted - isn’t it ridiculous? Hello, I’m Aleh and I started my company PLANETARIANS to fight a climate change and be a role model for my children. Let's look at the example of defatted seeds (the dry matter left after the oil is extracted from the seeds) that are fed as concentrates to animals today. From the initial 100% of the calories in the defatted seeds, humans get only 17% of that number of calories if we feed defatted seeds to poultry and then consume poultry. We get 9% of that total if we feed defatted seeds to pigs and then consume pork, and 3% (3!) of that total when we feed defatted seeds to cows, and then consume the beef. Given the current prices and annual volume of defatted seeds - we lose $77 billion every year. Defatted seeds repurposed for human consumption would make available 100% of those initial calories. The volume is large enough to feed 1.5 billion people. 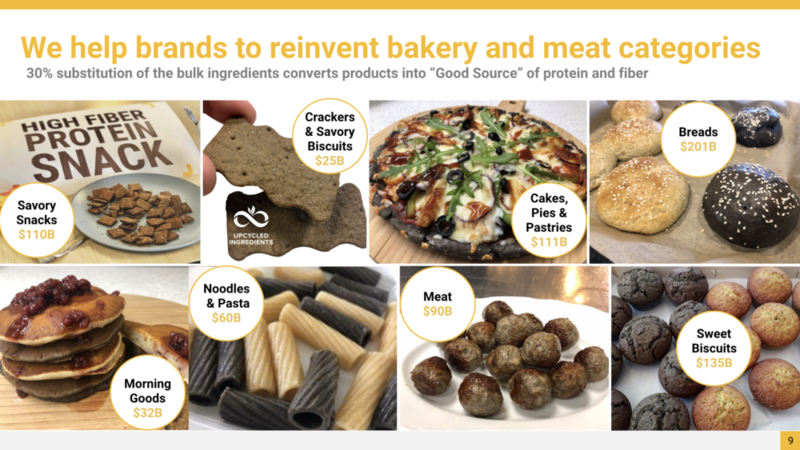 Moreover, high protein content in upcycled ingredients can turn bread and pasta into a Good Source of protein, and reduce cholesterol in meat applications for people willing to follow a flexitarian lifestyle. Previously high protein, high fiber products were unaffordable for the mass market. Repurposing defatted seeds from animal to human consumption creates an opportunity to create new meals for food aid at a fraction of the cost of current ones. The FDA recommended 2000 cal daily intake now can be sustainably manufactured under $1. To let these benefits come true - PLANETARIANS developed a technology that sterilizes, functionalizes fiber and makes nutrients available for human consumption. 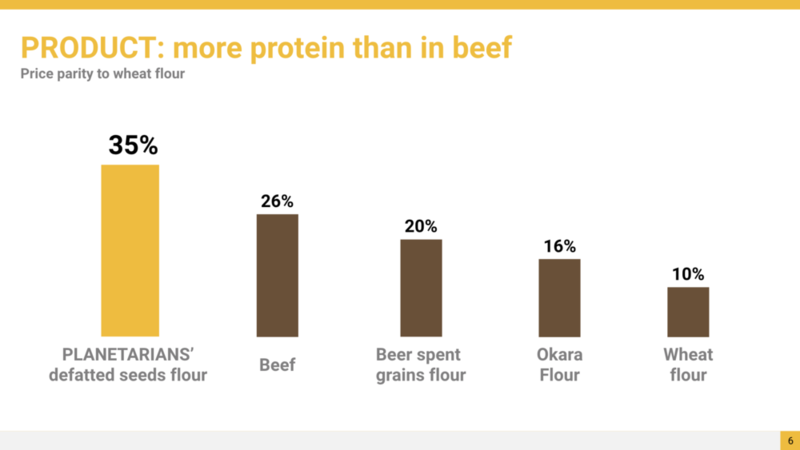 PLANETARIANS tech produces the flour with more protein than beef, 35%! Given the low cost of incoming by-products - PLANETARIANS flour can match the price of wheat flour and keep the costs of products the same. Market tests of chips made from PLANETARIANS flour resulted in 69% month-to-month growth on Amazon during Spring 2018. Chips were featured on ABC, recommended by Today’s Dietitian and named by National Sunflower Association as revolutionary technology in December 2018 issue of “The Sunflower” magazine. Now it’s obvious for everyone, that customers are ready for products made from upcycled ingredients. Success with chips gave us the right to offer our ingredients to large brands. PLANETARIANS flour showcased at IFT and SupplySide West resulted in trials and the following investment from Barilla’s venture arm Blue1877, Amadori (largest Italian meat processor) and Cereal Docks (largest Italian vegetable oil extraction plant). Imagined?- Now it’s a reality. Convert less healthy products into "good for you"
Making protein affordable - you help to feed the growing population. We believe that making upcycled ingredients available we help to fight climate change with every bite. Want to join our movement?- Your sample is waiting for you at our website.